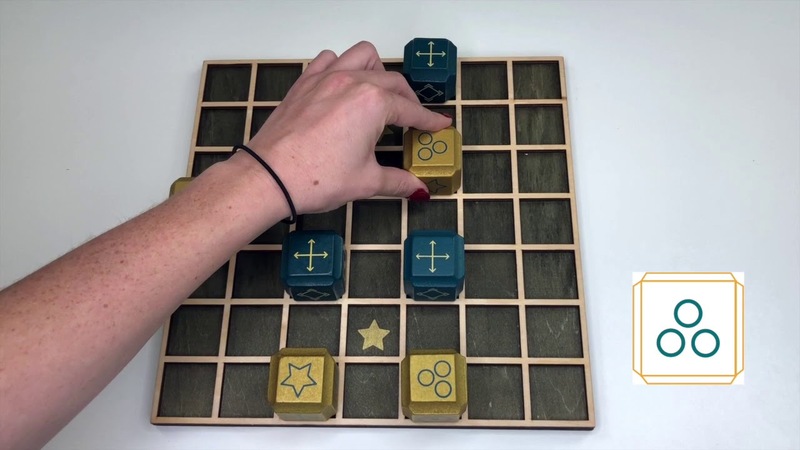 Begin the game by rolling your opponent's blocks on a flat surface to determine which symbols will start face-up. Then place their blocks in the 4 spaces diagonal from their home star. You can place their blocks in any orientation, as long as the 4 symbols you rolled remain face-up. Roll any one of your blocks once into any open adjacent space. You may not roll diagonally, and you may not roll into the star space. After rolling, you must hop that same block according to the symbol that lands face-up after the roll. You may only hop onto open spaces. A block may be removed from the board when it is rolled star side up onto the star space at the opposite side of the board. The Star Symbol may NOT be rolled face-up anywhere on the board except onto the star space at the opposite side of the board. If the Stop Sign is rolled face-up, the turn is over and the block does not hop to any other spaces. When the Cross is rolled face-up, the block hops one space in any vertical or horizontal direction. When the X is rolled face-up, the block hops one space in any diagonal direction. When the Slider is rolled face-up, it must slide in any vertical or horizontal direction until it is stopped by another block or the edge of the board. When the Hoops are rolled face-up, the block may hop in any combination of 3 horizontal or vertical steps. The block may even hop back to a space it has previously occupied. No block may be rolled into any star space, unless it is being rolled star-side-up onto the opponent's home star space (at which point it is removed from the board.) Players are also not allowed to end their turn on a star space. Players using the slider or hoops symbols, MAY move across the star, as long as they did not roll into the star space or end their turn on the star space. It is possible to prevent another player from moving by using your blocks and the edges of the board in such a way that they are trapped. When this happens, the player who is blocked has been Deblockle'd! The player who is NOT Deblockle'd may continue taking turns (and removing blocks from the board) until their opponent has been set free.